Epson at the end of 2014 decided that they were going to get into the fitness/running watch market. Many companies would start off by testing the waters, and releasing a single unit, such as the way FitBit initially came to market, and building from there. 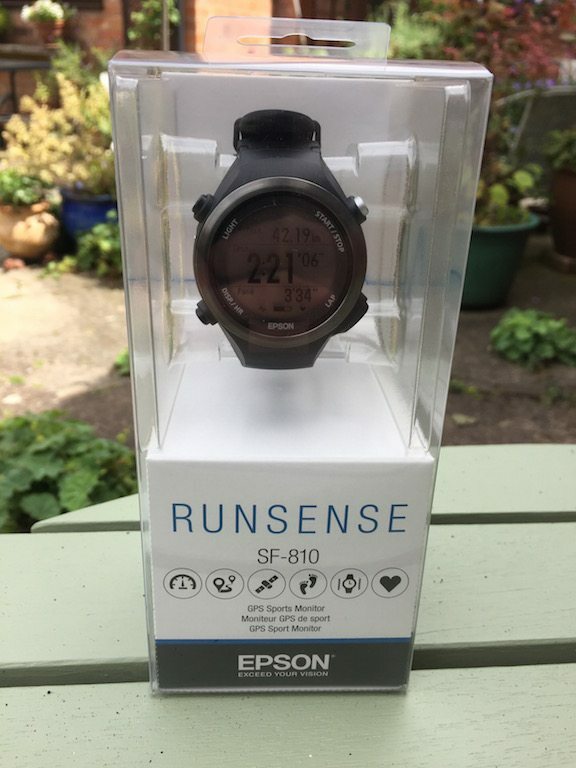 Not Epson, who as an initial offering launched not one device, but a fully fledged series of four running watches, under the RunSense banner, AND two activity monitors under the PulseSense banner. Dont join them, beat them! When receiving the review unit, I was particularly interested in testing the optic HR sensor found on the Epson SF-810. 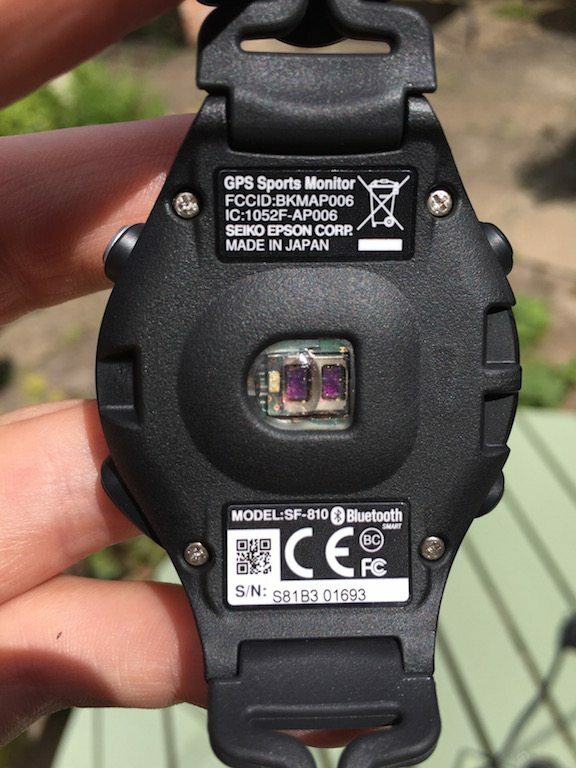 Whilst there is currently several different watches that use optical HR sensors, they all use a sensor from one of either two manufacturers – Valencell or Mio. Although its more likely that you’ll have used the Mio sensor in the past, as this covers the majority of the Big Boys – TomTom, Mio (well they made it, makes sense they’d use it!) and Garmin. Epson have really decided to flex their technological expertise with the SF-810 by developing their own optical HR. Which is an almost Apple approach to controlling the whole product end to end, I’ve even been told they developed their own extremely small GPS sensor, which is one of the reasons the SF-810 can pack so much technology into such as small form factor. 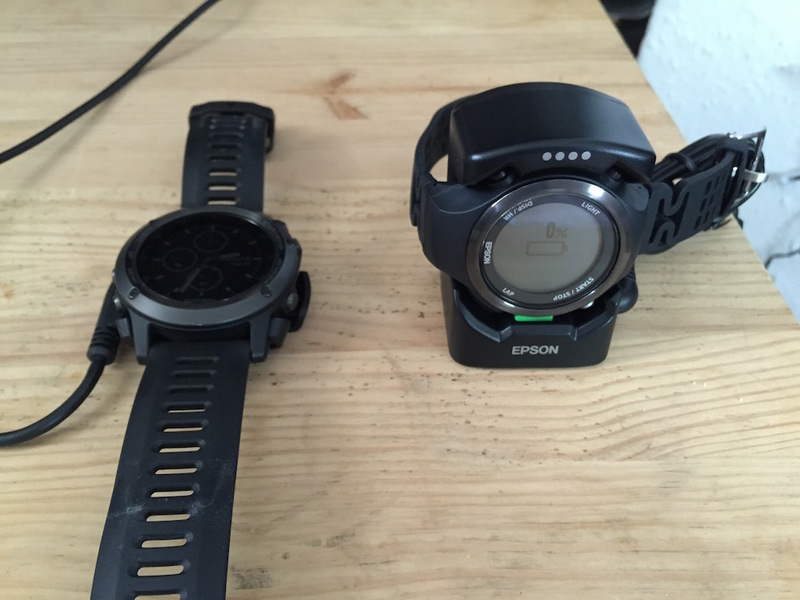 When I compared it to my Fenix 3 charger, I initially thought that Epson must have made the choice to go with the massive charger as a way of making savings having developed their own chips and sensors for the watch. Then I used the charger for the first time and was very pleasantly surprised. Thats a form factor design for you! Sure the Fenix 3 charger takes up very little space on its own, but it’s a bit of a fiddly blighter to attach the watch to. Plus when you finally get the watch charging, the watch sits flat, and splayed out, so the combined units take up quite a bit of space on the desk, or bedside table. By comparison, the Epson charger is so simple. 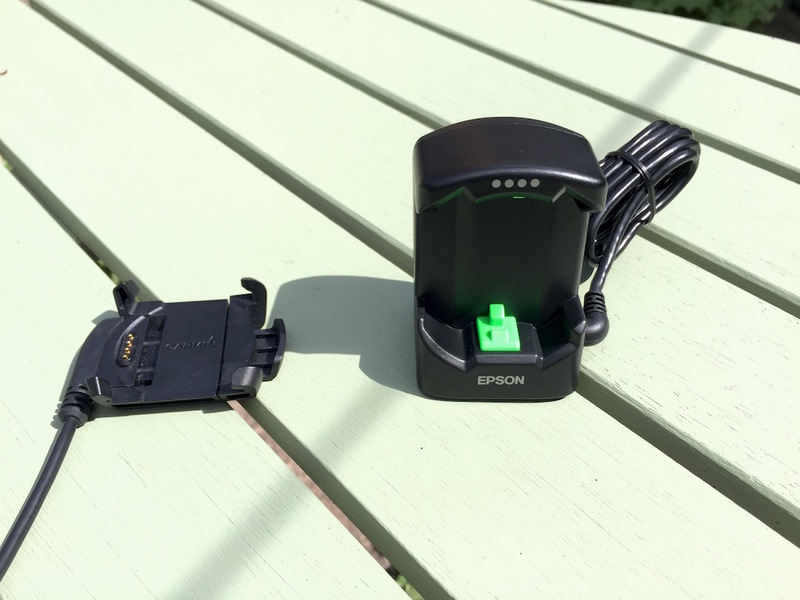 The Epson RunSense sf-810 review model pushes snuggly into the boxy charger with a reassuring *click*, there is no messing around trying to slot the watch into the charger, a simple push and you are away. When plugged in, the watch/charger combo stands proud, allowing the watch to wrap round it, taking up much less space – All in all a very well designed charger. Lets look at the elephant on the back of the watch, the optical heart rate sensor. The mainstay of watches sports watches utilise a heart rate sensor. 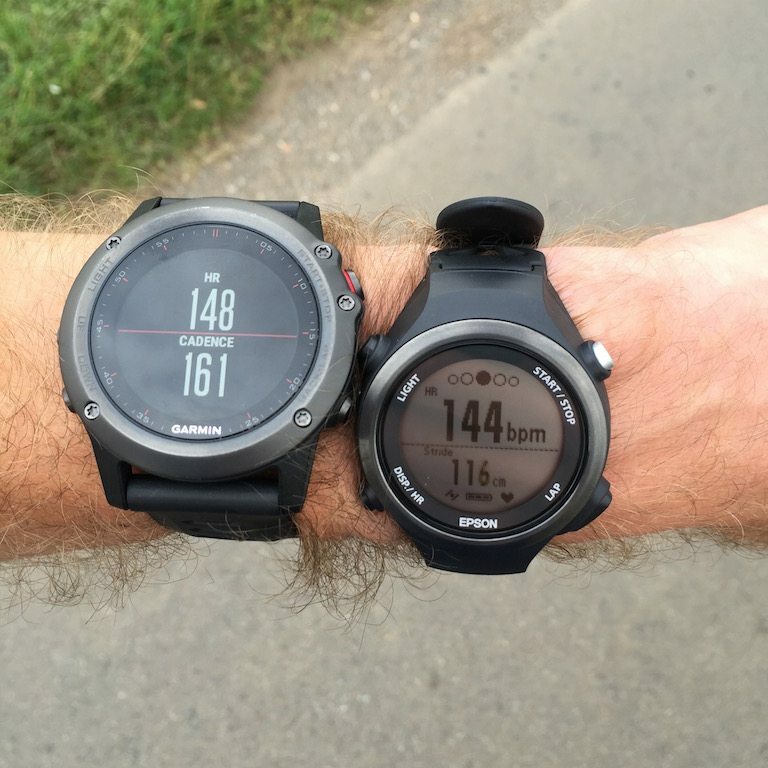 Over recent years companies like Garmin with the 920XT utilising the – Garmin HR-Run and the Wahoo TICKR have successfully levered further functionality from the heart rate sense, such as measuring cadence data. The Epson SF-810 has done away with the need for a separate HR monitor, but doesn’t lose a beat in terms of functionality. The optical heart rate monitor, and the including running data does make the SF-810 a very complete, single package running watch. The simple ability just to grab the watch and go running, without any need to go draw diving to find a chest strap, and remember where your heart rate monitor pod was out at the end of the last run is very freeing. But this is Epson’s first generation optical heart rate monitor, and as such its not completely 100% perfect. Maybe 95%. But the few niggles I had with it are common to all optical sensors at the moment. The most notable issue – the sensor doesn’t like it when I’m cold. Or should I say it doesn’t like it if I havnt had a good warm up. I’m a relatively slight chap, and if its chilly it seems that the blood decides not to go below my elbows – my GF can attest that during winter my hands have a temperature suggesting they are stored in the freezer over night! The point being, when doing a chilly morning run, it has taken the optical HR about a minute, or in this case kilometre or so after I’ve started running to actually for the watch to pick up my pulse. One of the ways I have found to improve the heart rate pick up, is to have the watch seated slightly higher up my wrist – 3 finger breadths – up from my wrist. This moves the watch away from the prominent ulna styloid of the wrist, giving the watch a flatter surface to interface with your skin. Having a good contact patch with an optical HR sensor is relatively important, as it means the watch sits flatter and thus reduces the amount of stray light that is able to hit the sensor. As stray light, is the enemy of optical heart rate sensors. Opitcal sensors are a little bit like vampires, but ones that can tolerate just a little sun light, but any more than a little, and they just cant concentrate on your pulse! Using the core functions of the watch is sooo simple. Want to run, press “Start”, find the GPS, and hit “Start” again to run, want to check your pulse, hit the “HR” button. It’s just that ridiculously simple. You can off set the finicky nature of the optical HR when setting off in the cold, as the watch does have a slight lag in GPS acquisition of maybe 30secs or so, but really this is a proper first world problem! You merely start the GPS search whilst putting on your trainers – you can also pre-cache satellite data from the phone app – although as this data is only valid for 2 hours, I found you were better off waiting for the satellites to be found by the watch anyway. This is quite a large departure from the Fenix 3, where the satelltie data can be stored 7 days, and is actually very effective at ensuring fast satellite lock – maybe something for Epson to look at in an update? Epson has a very effective set of running screens outside of the box, but changing them on the watch is basically not going to happen. 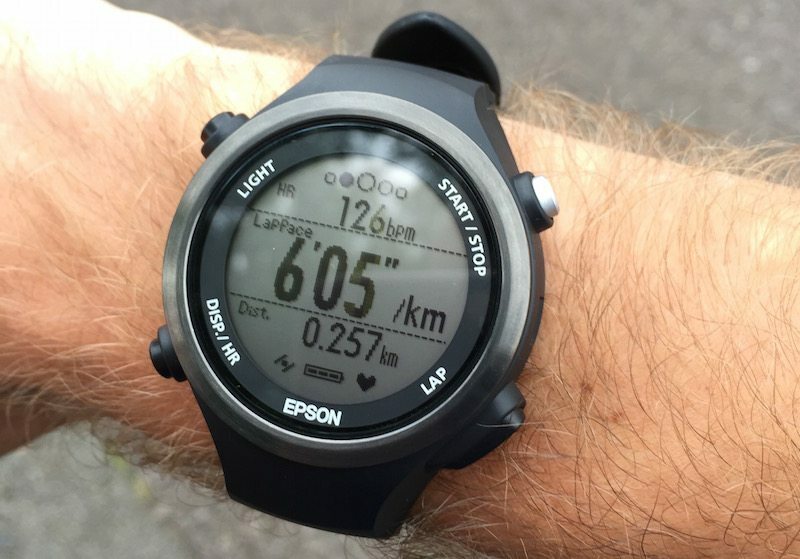 Initially the whole setup of the watch seemed astonishingly difficult, then I realised you are not supposed to do it on the watch, but on the Epson RunSense companion app instead. If you’ve ever tried to set up the device screens on a Garmin…well lets just say that I could have almost wept for joy seeing this interface. Thats not exaggeration. Setting up screens on the phone and having those settings beamed over the to watch is so much easier than the Garmin user interface! This is vital to the best part of using the Epson SF-810, as without the RunSense account, and crucially the app, you can’t wireless upload of your data. With technology today, especially sports technology, if the device needs to interact with wires with the computer, it really looks old hat – thankfully Epson has that covered. Auto upload via WiFi, such as with the Garmin’s would be a nicer trick, but given that does lock you into using Garmin Connect, I’m happy to press a button to get the upload started! 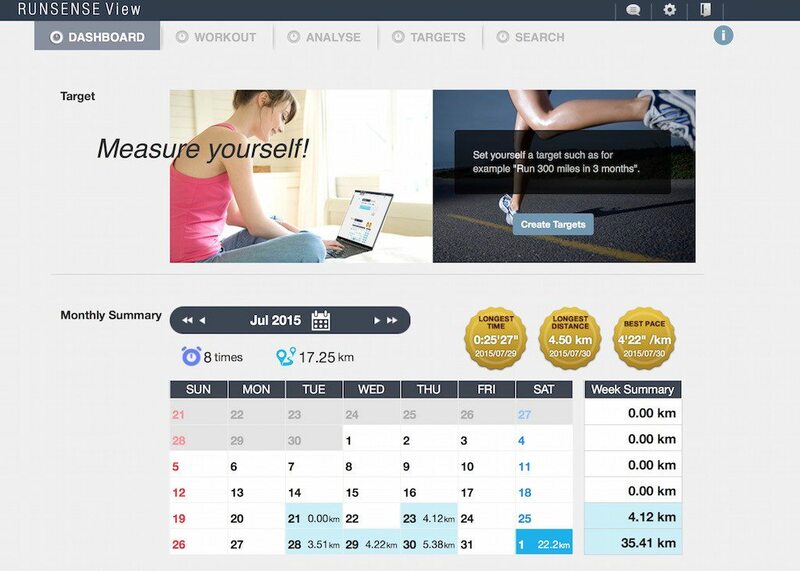 Within RunSense you can easily navigate around everything you need to do with your activities from the home page. 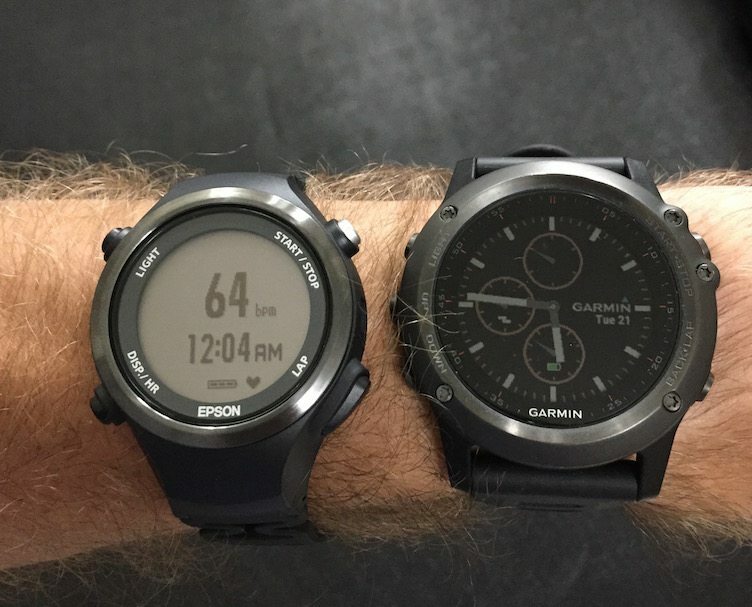 I’ll be honest I really like my Garmin Fenix. However Garmin can keep their Garmin Connect. I think there is a good reason why people, especially Garmin users, flocked to Strava – because the user interface is great. Epson has clearly seen the weakness in Garmin’s offering here as RunSense is just excellent. Its intuitive, it has everything you need in one straight forward screen. 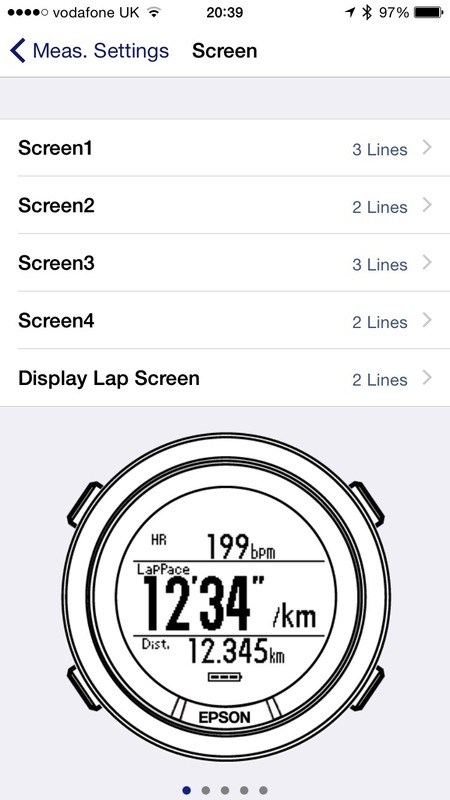 On this one screen you can see when you ran, the distances on that day that you ran, the week distance summaries. This is how to set up a site for everyone using your device. I you want to dig deeply into your data, you can. Its there. If you just want to keep an eye on things, and see what you did. Its all on the front page. Ultimately RunSense is a very elegant, and ultimately user friendly system. I deal with many different software systems working between hospitals and GP practice. I can’t tell you how great it is to find a system designed to display potentially complex data in an effect way. A system that is designed to be used by a human being, not someone with a degree in IT! The best part is that this data isn’t locked onto the web. The smart phone app contains about 95% of this simple, elegant data approach. Yes you are limited to space, but the data certainly is eminently accessible. I’ll be completely honest. I didnt warm to the EPSON SF-810 initially. That took me about 2-3 days of using it, finding out how the optical HR sensor worked, and then discovering the app. Certainly its grown on me since then, all the more because of its ease of use. It just works! I could go on much more for a conclusion but I think thats all I really need to say. 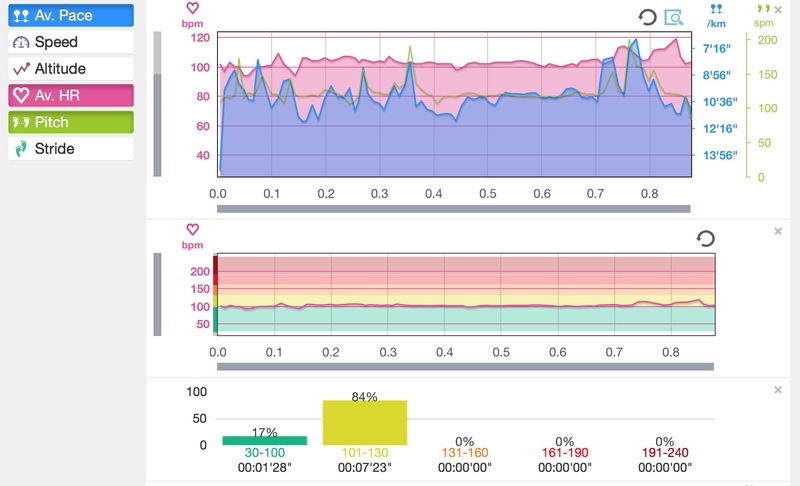 The optical HR data matches up with my classic heart rate monitor. The data from the watch is easily uploaded. Perhaps the ONLY thing to prevent it getting a full 5/5 is that the screen technology is a little dated when you compare it to the colour offering from the Fenix 3, or the crystal sharp display of the Polar M400. But then this is a sports watch i’m talking about. I’d hope that you were running fast enough that as long as you can see the numbers clearly you’d be happy! Any comments or questions about this first rate, yet first generation watch, drop them below!